Director of rugby Clive Griffiths is looking for Doncaster Knights to produce a capital display against London Scottish at the Athletic Ground tomorrow. Knights are hoping to end a run of five successive Championship defeats which has left them languishing in the bottom three. “We are at the wrong end of the table from where we wanted to be and instead of challenging for a top four spot we are battling to get out of the bottom four,” said Griffiths. 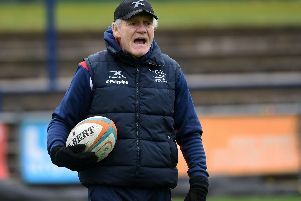 “Yorkshire Carnegie are currently bottom of the table but you’d expect them to go on a run when they get some of their injured players back and their proposed ten new signings coming in in the New Year, and second-bottom Hartpury can beat anyone on their day. “We are currently a few points ahead of both those sides but we need to start winning games and we need to be two or three wins ahead of them to start feeling safe and, then, hopefully start climbing the table in the second half of the season following the Championship Cup group fixtures. Griffiths is hoping that following their second half performance at Bedford, and the spirited display against unbeaten London Irish at the weekend, that Knights are finally starting to find some consistency. “We’ve struggled to put consistent performances together for most of the season,” he said. “Just when you think that we are doing okay someone comes up with a massive error and it’s generally the sort of bread and butter stuff we go through in training every week. “The game against Scottish is massive for us. They have some good players including one that I wanted but couldn’t afford in the summer. Having denied Irish a score in the second half of their 26-17 defeat the weekend, Griffiths is looking for more of the same today. With Griffiths unable to carry out his defensive coach duties since suffering a heart attack while out jogging, Knights have proved suspect in defence in several games despite the best efforts of fellow coaches Glen Kenworthy and Paul Cooke. But having managed to persuade veteran Phil Larder, a member of the England backroom team when they won the World Cup in 2003, to take temporary charge of the defensive work, Griffiths hopes the situation will improve. “Phil has come in to help us out and he’s asked a few questions of the players and made them accountable and he’ll continue to do that for as long as it takes.